Since this product line’s goal is providing short diversions, side-quest dungeons etc., I will not expect mind-shattering revelations, massive plots or particularly smart or detailed depictions, instead tackling the line for what it is. Additionally, it should be noted that this is intended for use in conjunction with the upcoming “Into the Wintery Gale”-saga. Editing and formatting are very good, I noticed no significant glitches. Layout adheres to a beautiful 2-column full-color standard and the pdf comes sans bookmarks, but needs none at this length. Cartography is full color and surprisingly good for such an inexpensive pdf, but there is no key-less version of the map to print out and hand to your players. The pdf does sport one nice piece of original full-color art – kudos! 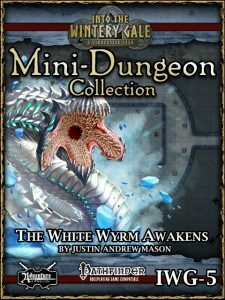 Justin Andrew Mason’s fifth mini-dungeon for ITWG is friggin’ AWESOME. High-concepts, awesome benefit, evocative culture and dungeon – superb. 5 stars + seal of approval, given sans any hesitation. You can get this superb mini-dungeon here on OBS and here on d20pfsrd.com’s shop!